Weslock has some of our funnest looking door levers. All of their designs are original. They definitely don’t conform with the industry norm. They have all types of designs from the elegant Urbana Woodward door lever to the twists of the Monoghan Premiere lever. If you are looking for a door lever that adds character you need to check out our line of Weslock levers. We are going to feature the Weslock Legacy oval lever today. It is one of the more constrained levers. It isn’t completely bland but it certainly isn’t outrageous in style. It has a tapered lever with three elegant accent rings at the base of the tapering. 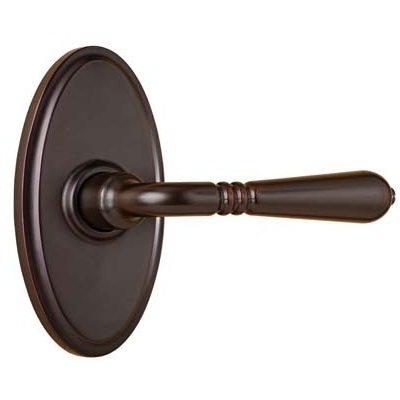 The oval backplate is always a good fit in your home. Oval backplates go along with any design. The best part of this lever set is the long list of options you have. You can choose from 4 functions and 2 finishes. You can have this lever customized for any door in the home.